There will be more than one post about this trip, but bottom line, we loved it. I've never regretted more not having a decent camera. Though iPhone cameras are definitely better than the point and shoots I've had in the past, mine just wasn't up to capturing the most fabulous things we saw. My daughter Adrienne had a real camera, and I've used a few of her shots, but I've finally ordered one of my own. But in some of these, there are barely distinguishable silhouettes, due to either distance or shooting into the sunlight. I've long wanted to visit the Serengeti in Tanzania, but in a kind of vague way that never seemed quite real. I never really pictured myself on safari, and it was kind of wild to all of a sudden find myself in Africa. It almost didn't happen. Adrienne and the kids were all up for it, and I'm the one who brought it up in the first place, because it seemed like it would be easier and cheaper to do it after we were already in Europe. But once I started researching it, both the prices and the travel time still seemed prohibitive. First I read that the average prices were a $1,000 per person, per day, and that was completely out of the question. 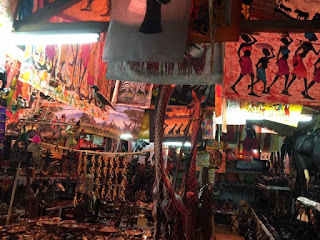 After a great deal of searching, I found places that were about $600 a day, and I think I may have even seen one around $450 per person per day. Still too much. Plus, the flight from London to Nairobi was 8.5 hours all by itself. Then there was either a 5 hour drive over rough roads or another couple of hours in the air. It was all just too much. 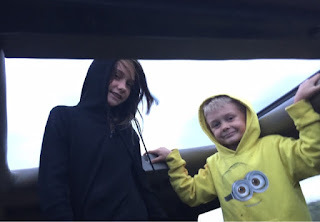 I couldn't see the kids holding up under those kinds of grueling travel times. So I called it off. But we were all pretty disappointed. It was going to be a major highlight of everyone's trip. After only a day, I started searching again. 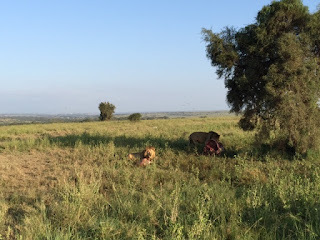 And I couldn't believe how the Nairobi Tented Camp was the solution to all of my problems. 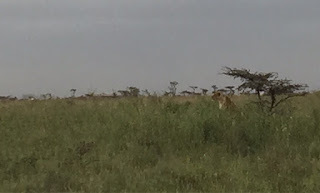 Nairobi National Park is located right outside the city. It is literally less than a thirty minute drive from the airport. There is a non-stop flight from London, so you can just zip in, stay a few days and then zip out. 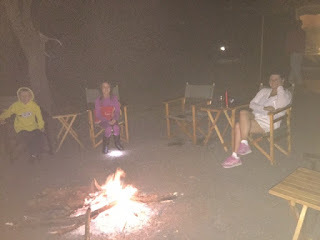 The price was about $260 per person per night, but that included every single thing you would need: transfers to and from the airport, soft drinks and wine whenever you wanted, 2 game drives and three delicious meals a day. Warthog lamp. We loved the décor. It is a truly wonderful place, the tents and common areas are so comfy. And the place is meticulously managed, the staff is beyond fabulous. Animals even ran tame around the tent area. We were warned not to stray off the path, and not to come out of our tents at night. No matter what we heard, we were told, we would be safe as long as we did not leave the tent. It seemed ridiculously easy to get to such an exotic location. Non-stop from Heathrow to Nairobi, picked up at the airport and whisked to the camp just a short distance away where every detail is taken care of every day and night, then whisked back to the airport at the end of our trip. The flights were about $850, and we were given a cheaper day rate at the camp for our last day, since we left around 7 pm and didn't actually sleep there. Since we got there at 6:30 am on our first day, we had 4 entire days full of fabulous experiences for less than $2,000 per person, including flights. The children only paid about 2/3 of the adult prices, so we caught a real break there. Adrienne and Donovan shared one tent, while Peri and I shared one next door. Each tent had a full bathroom with toilets and showers. The food was fabulous, ambience perfect. The common areas, both living and dining areas, were extremely comfortable and well decorated, really great places to hang out. full effect of lovely breezes. I really just can't say enough about how wonderful this place is. As soon as we got there, we said we wished we could stay forever, and we really hated leaving. It's magical, and we absolutely adored it. I hope to go back again in another year or two. The game may not be as varied, or as numerous, as the larger parks, but we were perfectly satisfied. We saw lions, rhinos, giraffes, zebras, buffalo, impala, hartebeest, eland, a small part of a submerged hippo, ostrich, vultures, cranes and more. All of the vehicles had some type of open roof, which made viewing the wide open spaces easier. Vegetarians can hang out together. We were amazed at how the different species hung out together while grazing, but even more amazed at how the rangers walked around in pairs where so many huge and dangerous animals roamed free. They all carried what looked like dart guns, but still. We learned the sad stories of some animals. There was Annie the lioness, who wasn't accepted by any of the three prides in the park. So she spent most of her days alone, sometimes joined by one of the male lions for short periods of time. Then we saw two poor eland, one with only half a tail and the other with only one horn. Since tails are used to chase away the many flies animals have to put up with, half a tail wasn't long enough to swat them off the back. That seems like torture. And since horns are used in self defense, having only one is a definite disadvantage. Our drivers were founts of information, and we learned so, so very much about the animals and plants in the park. Of course, I've already forgotten most of it, no surprise there. But in my defense there were so many varieties of birds and plants, there was no way I was ever going to retain so much new information. Still, it kept the rides interesting while looking for the animals. I was surprised at how much I enjoyed looking at the birds, I'd never been any kind of a birdwatcher before. We particularly enjoyed the colorful ones. There were a lot more blue on animals than I'd ever seen before. Who knew cranes were so gorgeous? There were some I was familiar with, like cranes, which were so much more beautiful than I'd expected. But it was also interesting looking at the white ones which settled en masse atop herds of buffalo. They feed on the flies the buffalo attract. That would seem like a win/win situation, but our driver said that the buffalo are not really bothered by the flies, so the birds are just being parasites. 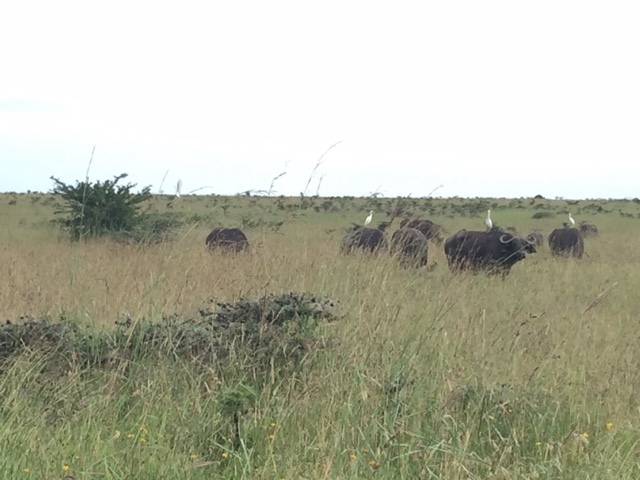 Since the buffalo didn't seem particularly bothered by the birds, either, we found that pretty amusing. ostriches, the female is mostly brown while the make is black and white. But we didn't know that the male's neck and legs turn bright pink when they are trying to mate with females. 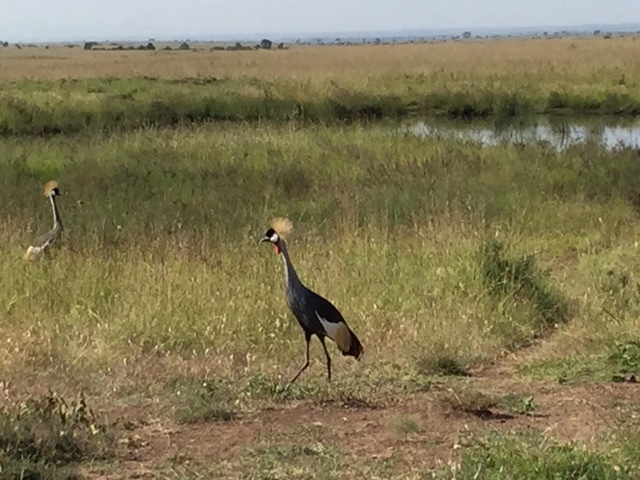 We actually got to see two different males do their mating dance, only to be rebuffed. It was very entertaining. In fact, I will do a short post right after this one showing that. We learned that young zebras are brown and white, and don't turn black and white until adulthood. We also learned that the locals called impalas Big Macs, because the dark lines on their backsides resemble the golden arches of McDonald's. 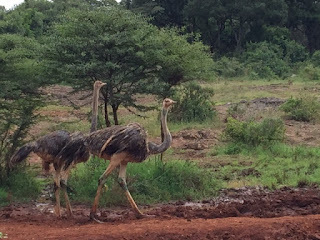 We saw ostriches, rhinos, warthogs and more, traveling in pairs or small families. Then herds of impalas, lions and others, where there was only one male allowed. On the ride from the airport, we saw a buffalo right in our path with a baby still attached by its umbilical cord, and another baby soon after, still wet from birth. Apparently, like horses, they get up and walk around right after they're born. Heading home on our last evening drive, our driver was told that lions had killed a buffalo. 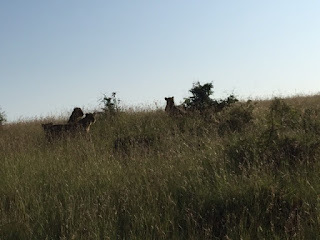 So on our last drive of the trip, 6 am the next morning, we headed to the kill site, hoping to find lions still feeding. It was our last chance to see Simba up close. Sure enough, there were a couple still feasting on the buffalo carcass. We were told that once they were done, the vultures would come and pick the bones clean. And we'd seen a buffalo skeleton earlier in the trip, so we knew what that would look like. Later, we ran into a small pride with a lioness, a young male and some cubs. We got out of the camp a couple of times, once to go to the mall near the gate we used most to get to an ATM, and once to a shop selling art and crafts made in Kenya. Everyone we came across was smiling, helpful and friendly. Even at Immigration in the airport, which has not been the case in the UK, though the general population has usually been a pleasure to mingle with. We found it interesting, though, when our driver asked if we had these types of malls in the States. "We had to copy it from somewhere," he said. Apparently it was the only mall in Nairobi and had been there less than two years. The Nairobi airport sustained significant damage from a fire within the last 18 months or so, and while the Departures area is nice and new, the Arrivals area is in the parking garage. An effort was made to make it bright and welcoming, though. I love the vivid color in Kenyan art, the shop we went to had plenty I would have loved to take with me. 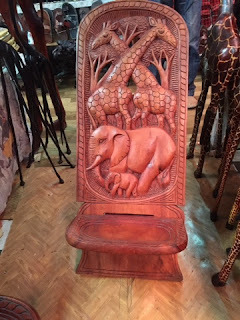 There were also the most amazing pieces of furniture. One was well worth the $950 asking price which included shipping, in my opinion, but it would have been even more of a steal with the 30% off that would probably have been accepted. As our driver told us, bargaining is not considered rude at the shop, it is expected. I really regret that there will be no room in my future camper for that chair. But there were wall hangings I'd have taken if I'd thought they would have survived my travels until I got home. There were just so many lovely things. 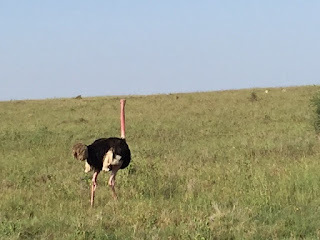 I didn't see much of Kenya outside of the Nairobi airport and the National Park, but I loved what I saw and thoroughly enjoyed meeting all of the people we came into contact with. I definitely hope to return. And who knows, I may make it to the Serengeti eventually, after all. 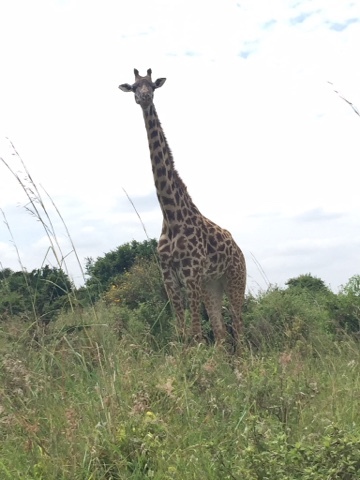 More posts coming on ostrich mating, elephant orphanage and the model giraffe. Get your wildlife entertainment here! Outstanding!!!! The whole idea of you staying in a tent, unreal.